The Official Irish Republican Army or Official IRA (OIRA; Irish: Óglaigh na hÉireann Oifigiúil) was an Irish republican paramilitary group whose goal was to remove Northern Ireland from the United Kingdom and create a "workers' republic" encompassing all of Ireland. It emerged in December 1969, shortly after the beginning of the Troubles, when the Irish Republican Army split into two factions. The other was the Provisional IRA. Each continued to call itself simply "the IRA" and rejected the other's legitimacy. Unlike the "Provisionals", the "Officials" didn’t think that Ireland could be unified until the Protestant majority and Catholic minority were at peace with each other, they were Marxist and worked to form a united front with other Irish communist groups, named the Irish National Liberation Front (NLF). The Officials were called the NLF by the Provisionals and were sometimes nicknamed the "Red IRA" by others. It waged a limited campaign against the British Army, mainly involving shooting and bombing attacks on troops in urban working-class neighbourhoods. Most notably, it was involved in the 1970 Falls Curfew and carried out the 1972 Aldershot bombing. In May 1972, it declared a ceasefire and vowed to limit its actions to defence and retaliation. By this time, the Provisional IRA had become the larger and more active faction. Following the ceasefire, the OIRA began to be referred to as "Group B" within the Official movement. It became involved in feuds with the Provisional IRA and the Irish National Liberation Army (INLA), an OIRA splinter group formed in 1974. It has also been involved in organized crime and vigilantism. The Official IRA was linked to the political party Official Sinn Féin, later renamed Sinn Féin - the Workers Party and then the Workers' Party of Ireland. The sense that the IRA seemed to be drifting away from its conventional republican roots into Marxism angered more traditional republicans. The radicals viewed Ulster Protestants with unionist views as "fellow Irishmen deluded by bourgeois loyalties, who needed to be engaged in dialectical debate". As a result, they were reluctant to use force to defend Catholic areas of Belfast when they came under attack from Ulster loyalists—a role the IRA had performed since the 1920s. Since the Northern Ireland Civil Rights Association marches began in 1968, there had been many cases of street violence. The Royal Ulster Constabulary (RUC) had been shown on television in undisciplined baton charges, and had already killed five non-combatant civilians, three were children. The Orange Order's "marching season" during the summer of 1969 had been characterised by violence on both sides, which culminated in the three-day "Battle of the Bogside" in Derry. Accounts at that time suggest that the IRA members split roughly in half, with those loyal to the Goulding-led "Official" IRA prominent in some areas while the Provisional IRA were prominent in others. A strong area for the Official IRA in Belfast was the Lower Falls and Markets district, which were under the command of Billy McMillen. Other OIRA units were located in Derry, Newry, Strabane, Dublin, Wicklow and other parts of Belfast. 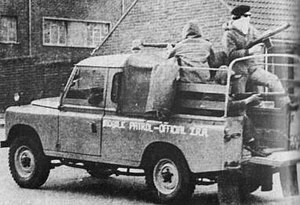 However, the Provisionals would rapidly become the dominant faction, both as a result of intensive recruitment in response to the sectarian violence and because some Official IRA units (such as the Strabane company) later defected to them. There was a similar ideological split in Sinn Féin after a contentious 1970 Sinn Féin Ard Fheis. The leadership of Sinn Féin passed a motion to recognise the Parliaments in London, Dublin and Stormont but failed to attain the prerequisite two-thirds majority necessary to change Sinn Féin's constitutional opposition to partitionist assemblies. Those defeated in the motion walked out. This resulted in a split into two groups with the Sinn Féin name. Those supportive of Seán Mac Stiofáin's "Provisional Army Council", were referred to in the media as Provisional Sinn Féin, or Sinn Féin Kevin Street, and contested elections as Sinn Féin. The other group, under the leadership of Tomás Mac Giolla, was to contest elections first as Official Sinn Féín, then Sinn Féin The Workers' Party, and aligned itself with the Official IRA, as the Marxist faction had come to be known. The party retained the historic Sinn Féin headquarters of Gardiner Street, thus giving legitimacy to its claim, in the eyes of some, to be the legitimate successor of that party. It was briefly known popularly as Sinn Féin Gardiner Place.